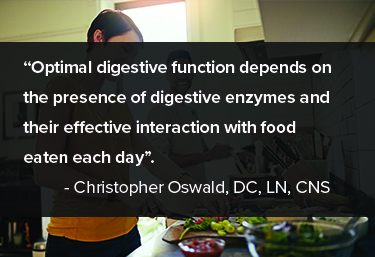 Digestive enzymes are key players in effectively supporting the optimal breakdown of the food eaten each and every day. When this food is not properly digested one can experience a variety of consequences such as gas, bloating, occasional indigestion, and undigested food in stool. Honestly, any time that one experiences stool changes or functional gastrointestinal complaints, the consideration of a digestive enzyme should be on the list. * With the understanding of some of the potential symptoms which would cause one to consider digestive enzyme supplementation, it is also important to have a clear understanding of the events which can lead up to this need. The modern era has resulted in an on-the-go lifestyle of consistently eating when in a hurry or stressed. The process of digesting food is an eloquent symphony which has a very specific pattern to ensure optimal function. Adequate time is not taken to sit down and enjoy a meal. Taking a moment to just look at food can provide visual cues to the brain to start preparing the body.2 The pleasant aroma of a favorite, or any, dish helps to start the flow of saliva, an important initial step of the digestive process.3 More so, many are not taking time to adequately masticate their food, which further reduces the time food has to interact with in the oral cavity with saliva. While saliva has several roles, an important one is its ability to initiate the digestion of starches in maltose to be further digested later on in the digestive process.4 Effectively “activating” this first step in the digestive process requires pause which many are unwilling or unable to do. This can create challenges further down the digestive tract when areas are not well equipped to deal with starches that have not had time to adequately be broken down by saliva. Oshima T, Miwa H. Epidemiology of Functional Gastrointestinal Disorders in Japan and in the World. Journal of Neurogastroenterology and Motility. 2015;21(3):320-39. doi:10.5056/jnm14165. Mattes, RD. Physiologic Responses to Sensory Stimulation by Food: Nutritional Implications. Journal of the American Dietetic Association. 1997;97(4):406-10. Mego M, Accarino A, Malagelada JR, et al. Accumulative effect of food residues on intestinal gas production. Neurogastroenterol Motil. 2015; 27(11):1621-8. Smith CH, Boland B, Daureeawoo Y, et al. Effect of aging on stimulated salivary flow in adults. J Am Geriatr Soc. 2013; 61(5):805-8. Laugier R, Bernard JP, Berthezene P, Dupuy P. Changes in pancreatic exocrine secretion with age: pancreatic exocrine secretion does decrease in the elderly. Digestion. 1991;50:202–11.